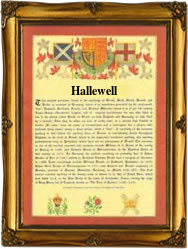 This interesting surname with variant spellings Hallawell, Hallewell, Helliwell, Holliwell Hollowell etc., is of English, locational origin from any of the several places named with the Old English pre 7th Century elements "halig" meaning "holy", plus "well(a)", a well or spring. These places include Halliwell in Lancashire, recorded as Haliwell circa 1200; Holwell in Dorset and Oxfordshire appearing respectively as Halegewelle and Haliwelle in the Domesday Book of 1086; Halwell and Halwill in Devonshire, recorded as Halgewilla in 1086, and Holywell in Northumberland, Kent, Cambridgeshire and Cornwall. There is also a place in Clwyd called Holywell. John de Halewell, of Halliwell, was Dean of Lancashire in 1288, and in 1327 Editha atte Holywelle appeared in the "Subsidy Rolls of Somerset". An interesting namebearer was James Orchard Halliwell, (1820 - 1889), who arranged and described the Stratford-on-Avon archives, and wrote much on the history of the town. His "Life of Shakespeare" appeared in 1848. A Coat of Arms granted to the Halliwell family consists of a gold shield with three silver goats trippant, and attired in gold, on a red bend. The first recorded spelling of the family name is shown to be that of Osbert de Haliwell', which was dated 1200 - "The Pipe Rolls of Suffolk", during the reign of King John, known as Lackland, 1199 - 1216. Surnames became necessary when governments introduced personal taxation. In England this was known as Poll Tax. Throughout the centuries, surnames in every country have continued to "develop" often leading to astonishing variants of the original spelling.